As I mentioned the other day, whilst at the Green Man Festival I was completely offline for four days, and so was relying solely on the sponsored Guardian & Observer stand for my news. Something struck me whilst reading the technology pages in The Observer on Sunday. 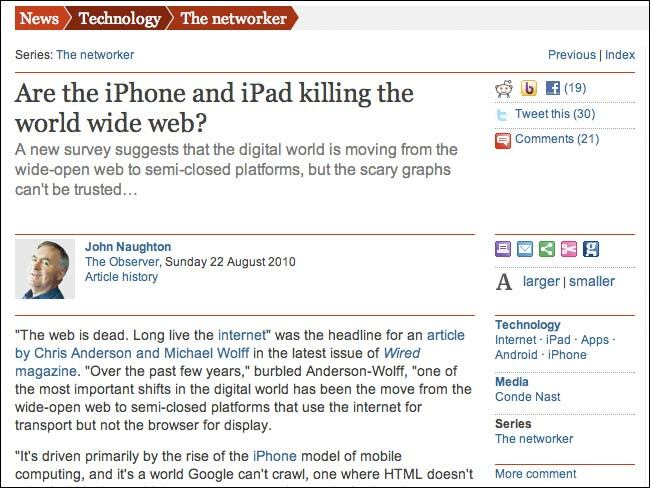 John Naughton’s “Networker” article was a follow up to the Wired’s ‘Web is dead’ linkbait. As a summary of the ding-dong debate the original piece had caused, it was a very good write-up. It occurred to me, though, that online, the article could pretty much have been rendered as “Read this. Read this. Discuss”. But it wasn’t that the piece was a weekend write-up of things that I had already read online earlier in the week that I noticed. It was how flat a technology piece seemed without reader’s comments on the end. It genuinely felt like the article had finished prematurely. There were some people making the point that Apps did not begin and end with the Apple iTunes infrastructure, and several people arguing for and against the strength of Android's position in the market. 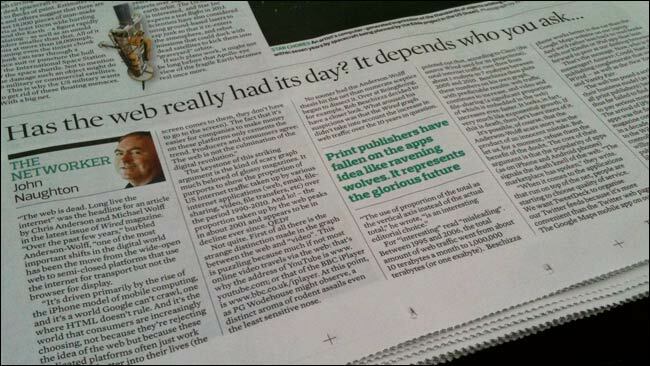 Maybe not the journalist who needs to wake up after all, eh? There is a lot of debate about whether comment threads on news sites, and the constant sniping, flaming and bickering that seems to go with them, add anything to the user experience. But, being in the middle of a weekend where I could only have print news, I was astonished at how much I missed the ‘below the line’ banter. By Martin Belam on 27 August 2010. For me it's the exact opposite - when I go and read a newspaper I find it refreshing that each news article or comment piece isn't immediately followed by JohnBoy2010 or whoever demanding to know if the writer got paid for this. I guess it depends on what you get out of reading comments. I understand what you are trying to express, but there are all kinds of people in this world, some are impatient and just skim through the content, and just post their opinions and some read, analyse and then post. So it depends from person to person. I like reading other readers opinions at the bottom of online articles. The only thing that bothers me is that most of them show them in the reverse order with the most recent on top. This makes them very confusing to understand as people comment about other's opinions. Too right - the real meat and potatoes in a post is usually found in the comments. Youtube is a good example. Sure, you get lots of flaming but also lots of substance and good opinion. For me it depends on the site and 'quality' of the comments. There are some websites I go on where all comments are pretty much negative, and I get bored of these types of sites pretty quickly. However when there's a website whereby there's always a good, healthy discussion after an article or blog post is posted up, I tend to like these types of websites. After all, an article writer won't be right 100% of the time hence good, healthy comments can be benefitial. I guess it's when the comments turn to abuse that I dislike it. I myself enjoy the "below the line' banter myself, as long as there is some substance and relevance to the original post. I love reading and learning, and I do both to open my mind to new insights and possibilities. I do appreciate thought provoking commentary, whether I agree with the content or not. I like reading other readers comments for online articles. I think the all comments should be turn off by default and let the visitors enable it manually to read the comments. It is pain silly to read comments without reading the articles. Sounds like the person is there to pick a fight. I don't think the comments at the end of most web pages are very informative. Usually it is just someones views on a subject that have no idea what they are even talking about. To me, the comments are not the meat and the potatoes of the article. You know what? The comments that appear on my local newspaper's website show how this area is full of racists, bigots and other assorted dullards. I also like reading other readers opinions at the bottom of online articles. THE INTERNET IS TAKING OVER !!! In my honest opinion , I think reading newspapers online on my iPad is not as much fun as actually holding the real thing , but that's just me .